I have received information from Utah Housing that if a buyer utilizes Utah Housing (either the First Home or the First Home Plus), that they cannot ALSO do the $7500 tax credit! It is either one OR the other, but not both. After receiving this information from Utah Housing, I called and they explained to me that it has to do with the tax relief status of how Utah Housing receives the money through their arrangement with IRS that this is called 'double dipping' if the buyers use both the Utah housing AND the tax credit. We will need to do analysis on the buyer's individual situation to find out which direction benefits them the most: ie) using Utah Housing or using the tax credit. Just like yesterday, Bonds received good news when the market opened up and as the morning progressed, prices have worsened. While I recommended floating for the first two hours, I have now issued an alert to lock, as prices are off 31 basis points and lenders are in a position to reprice for the worse. The 3rd Quarter Advance consumer spending report came in today at the fastest decline in 28 years, and the 3rd quarter GDP report decline indicates we are heading toward the "textbook" definition of a recession which is two consecutive quarters of declining GDP. Both reports have softened the stock market and we have a level of support in the Bond Market that prices are currently hovering above. With the Fed Funds rate cut of .5% yesterday, and a somewhat coordinated effort with other international cuts, have helped buoy the dollar against foreign currencies, helped oil futures from spiking, and is helping Bond Prices (overall). So for now, I recommend floating, as we watch to see how this most recent rate cut is handled in the financial markets. The day started with Bonds trading slightly higher with stocks also slightly higher in response to the anticipated Fed Funds rate decrease this afternoon. As reported in days past rate watches, Bonds are anticipated to react unfavorably to the rate cut and this was in fact how the day played out. When the Fed announced the cut, Bonds began trading at their lowest level of the day, and the floating bias changed to an alert to lock as investors were at a point they would consider a reprice for the worse. For now, we will watch to see how positive this information is received in the equity market (stocks) and how it effects Bonds, Mortgage Backed Securities and the Treasury Market (safe haven for money). "My fiance and I are the proud new owners of our very first home. We were referred to Marty by our real estate agent, Marlene Lewellyn at Remax Realtors. Marty and his team got us into our home in less than month!! 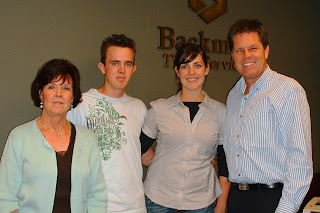 They were really helpful and always let us know what we needed to do and helped us get it done so that we could close. I would recommend Marty and his team to anyone looking to get into their first home or into a newer, better, house! Stocks rallied early with the Fed beginning its 2 day FOMC Meeting and with anticipation of a .5% rate cut to be announced tomorrow afternoon. This rally was cut short, however, when Consumer Confidence came in at 38 vs. an expectation of 52, the lowest in 41 years! Bonds are not yet getting a bump in price from this unfavorable report (higher price, lower yield, lower mortgage rates) and Bonds are actually moving lower, now below 4 levels of support, toward the worse pricing of the year (October 15th). Yesterday, I looked at the Bond Charts and found the worst worst bond prices of the year-and highest rates of the year- were on October 15th, August 7th, July 18th, June 16th and March 6th). Interestingly, the best bond prices and best interest rates this year were on September 5th, May 9th, April 9th, March 18th, and January 18th. The most recent cycle from best to worst rates has taken approximately 6 weeks and this is the volatility I have been speaking about in my rate watch comments! For now, I recommend Locking, but the market can change very quickly (as briefly outlined above) and I will keep you posted of market movement. In Real Estate news released today, the Shiller 20-City Home Price Index fell for the 15th consecutive month, down 16.6% from a year earlier. There have been wild swings overnight in the international Stock and Bond Market over concerns of global recession. This week is FULL of economic reports due to be released, but I will focus on the Federal Reserve meeting this Wednesday at 2:15 p.m ET. There is a high probability of the Fed lowering the discount rate .5% and there are rumors of possibly a .75% decrease. At their last meeting there was a 100% chance in the Bond market futures that the Fed would lower the rate by .50%, and as you might remember, the Fed DIDN'T lower the rate. Really, regardless of whether the Fed lowers or doesn't lower the Fed Rate, the Bond market reacts negatively to the move and Bond prices have suffered. For this reason, I recommend Locking and will let you know if things change. Housing news released today: New home sales were up by 2.7% and inventory is the lowest in 4 years and the average new home sales price is $218,400, down 9.1% in the past year.